The Avocent SwitchView PS/2 KVM (2SVP10-001) desktop switches are a perfect buy for small offices and home offices. This affordable KVM switch adds both control and flexibility to your desktop. 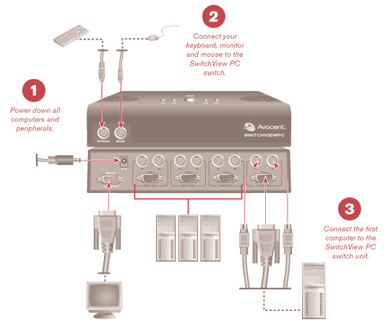 The Avocent SwitchView PS/2 KVM (2SVP10-001) switch lets you control two PS/2 computers from one keyboard, monitor and mouse --- adding valuable desktop space for other peripherals. Lighted LED indicates which computer you are accessing and audible indicators confirm channel switching. With color-coded cables for easy installation, customizable channel selections and error free boot up, the Avocent SwitchView PS/2 KVM (2SVP10-001) switch offers you the most complete desktop KVM features at the industry's most affordable price.